York University's Division of Advancement provided Air Miles to Humanities PhD student Mark Terry for travel use to Marrakech, Morocco last month to participate in the United Nations Framework Convention on Climate Change (COP22), the United Nation's follow–up conference to the event held last Fall in Paris that led to the ‘Paris Agreement’. 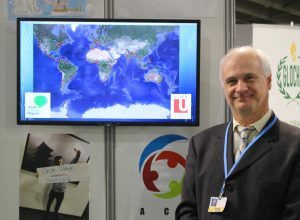 York University PhD Candidate Mark Terry presenting the Youth Climate Report project at the UN Youth Booth during COP22, Marrakech, Morocco, November 10, 2016. "This is the first time Air Miles have been used as a way to support graduate student travel at York,” says Barbara Crow, Dean of the Faculty of Graduate Studies. “This was a reflection of graduate studies working with Advancement around some of the unique ways we can support graduate education." It's an example of an innovative approach Dean Crow says, so "grad students can present their research as well as have an opportunity to hear research results in a national and international context." Mikhael Bornstein, Advancement’s Director of Donor Programs, says while it’s the first occasion of using Air Miles for graduate student travel, other Faculties have used them previously. Currently, Air Miles are occasionally donated to the University, and Advancement has a plan in place to actively solicit them on a quarterly basis from alumni. A documentary filmmaker as well as a graduate student, Terry was in Marrakech to present on his work exploring data systems and film as instruments of social change. "I had some great success presenting my PhD research project," he says. "I'm proud to say it has been adopted by the UN as an official data delivery system under their Article 6 (Education and Outreach) mandate. As a partner program, the UN recommends my project to the nations of the world to use as a resource for research and policy implementation." More than 700 people were in attendance at the UN press conference where the announcement was made. "It was a major event for me and my research, and for York,” he says. Called the Youth Climate Report, Terry's project is a multilinear, interactive, database documentary film project using a platform of a Geographic Information System map. It contains 250 videos of climate research produced by youth from around the world, which includes 180 that formed this year's competition. The map situates climate change research where it is occurring, providing the title, name of the filmmaker, location by longitude and latitude, and video about the subject of the research. Terry notes his work is focused on "exploring new digital ecologies that have the ability to advance instruments in the humanities." Further highlights of this research can be found on the United Nations Framework Convention on Climate Change website.